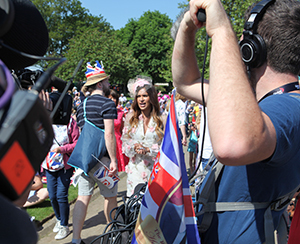 On this royal occasion in May, the eagerly anticipated wedding of Prince Harry and Meghan Markle, Dejero’s CellSat blended connectivity solution provided Global TV with that confidence as they went live in Windsor, where large crowds were likely to cause havoc with cellular network traffic, and fiber was not readily available given the temporary locations of the live shots. What’s more, this occasion saw the first deployment of CellSat in Europe, so the customer’s belief in the solution was unfaltering. Behind the scenes of live production is rarely glamorous. On the day of the event, Global TV was tucked into a very small area next to a cafe outside Windsor Castle. They were also surrounded by nearly a hundred thousand visitors, live streaming and posting photos back to their friends and families around the world, congesting the cellular networks. A vehicle equipped with a satellite antenna was not an option for this event, given the constraints of the Windsor location. With restricted space available for equipment, a versatile and reliable fly-away solution was needed. The Dejero CellSat solution demonstrated its versatility to Global TV for this critical coverage. CellSat intelligently blends cellular connectivity from multiple mobile network carriers with Intelsat’s Ku-band IP satellite connectivity to provide the necessary bandwidth on demand. This enables broadcasters to reliably deliver exceptional picture quality while on location. Providing enhanced reliability and HEVC picture quality in situations where cellular networks are congested or cell coverage is limited, CellSat leverages network blending technology to improve reliability. If available cellular bandwidth dips, additional satellite bandwidth is automatically provided to the blended network. In Windsor, very little cellular bandwidth was available during the busiest part of the day, but the CellSat solution consistently up to 7.5 Mb/s of bandwidth more than enough to deliver exceptional picture quality. The solution is designed to help broadcasters manage their transmission costs by using cellular when available, or CellSat when added reliability is required. With the convenience of midstream activation, CellSat enables users to start a live broadcast in Cell mode and when additional bandwidth was required, switch to CellSat mode without stopping the live feed, helping to manage costs and achieve the best results. The Dejero CellSat solution provided the additional bandwidth needed for Global TV to deliver exceptional coverage of the monumental Royal Wedding. With reliable connectivity, crews had confidence in their ability to deliver high-quality content for their 3 million+ viewers eagerly watching every moment back in Canada. On the day of the wedding, Global TV used CellSat to provide its viewers seven hours of on-location coverage with extensive reporting of this special event. During the build-up and post-event, Entertainment Tonight Canada’s Cheryl Hickey and Sangita Patel delivered special reports live from the UK. On the road for the week of the wedding, Global TV’s award-winning flagship newscast, Global National anchored by Dawna Friesen, broadcast live each evening from Windsor. As of May 25th, Corus entertainment, owner of the Global Television Network, reported that overnight Numeris data1 put Global TV’s coverage of the wedding at 434,000 viewers for the 5:30 a.m. to 11 a.m. time slot. Global News’ live online stream garnered three million views. As of May 24th Global News and ET Canada’s Royal Wedding content on YouTube reached more than six million unique viewers, and the full ceremony replay achieved more than 1.8 million views. Globalnews.ca also saw 4.35 million page views on its Royal Wedding content, and the network’s Facebook videos saw 2.23 million views.